Johari, M., Hosseini-Motlagh, S., Nematollahi, M. (2017). Simultaneous coordination of review period and order-up-to-level in a manufacturer-retailer chain. Journal of Industrial and Systems Engineering, 10(special issue on production and inventory), 1-17. Maryam Johari; Seyyed-Mahdi Hosseini-Motlagh; Mohammadreza Nematollahi. "Simultaneous coordination of review period and order-up-to-level in a manufacturer-retailer chain". Journal of Industrial and Systems Engineering, 10, special issue on production and inventory, 2017, 1-17. Johari, M., Hosseini-Motlagh, S., Nematollahi, M. (2017). 'Simultaneous coordination of review period and order-up-to-level in a manufacturer-retailer chain', Journal of Industrial and Systems Engineering, 10(special issue on production and inventory), pp. 1-17. Johari, M., Hosseini-Motlagh, S., Nematollahi, M. Simultaneous coordination of review period and order-up-to-level in a manufacturer-retailer chain. Journal of Industrial and Systems Engineering, 2017; 10(special issue on production and inventory): 1-17. In this article, manufacturer-retailer supply chain coordination (SCC) has been developed under periodic review inventory system. In the studied model, the retailer as downstream member uses periodic review inventory policy and decides about review period (T) and order-up-to-level (R). Also, the manufacturer as upstream member faces EPQ system and determines the number of shipments from manufacturer to retailer per production run (n) as a decision variable. Firstly, the problem is investigated in decentralized and centralized models and accordingly, in order to coordinate the mentioned supply chain, a coordination scheme based on quantity discount is proposed. Maximum and minimum discounts, which are acceptable for both members, are determined. Numerical examples and sensitivity analysis indicate that the proposed coordination scheme improves the profitability and performance of both members and entire SC toward decentralized model. Moreover, the developed coordination model can share extra profit between SC members according to their bargaining power fairly. Aljazzara, S. M., Jabera, M. Y.,& Goyal, S.K.(2016). Coordination of a two-level supply chain (manufacturer–retailer) with permissible delay in payments. International Journal of Systems Science: Operations & Logistics, 3(3), 176-188. Annadurai, K., Uthayakumar, R.(2010). Reducing lost-sales rate in (T,R,L) inventory model with controllable lead time. Applied Mathematical Modelling, 34, 3465–3477. Arani, Vafa, H., Rabbani, M., & Rafiei, H. (2016). A revenue-sharing option contract toward coordination of supply chains. International Journal of Production Economics, 178 42-56. Baganha, M.P., Cohen, M.A.(1998). The stabilising effect of inventory in supply. Operations Research, 46 (3), 572–583. Bijvank, M., Johansen, S. G.(2012). Periodic review lost-sales inventory models with compound Poisson demand and constant lead times of any length. European Journal of Operational Research, 220(1), 106–114. Boyacı, T., Gallego, G.(2002).Coordinating pricing and inventory replenishment policies for one wholesaler and one or more geographically dispersed retailers. International Journal of Production Economics, 77(2), 95–111. Braglia, M. , Castellano, D.,& Frosolini, M. (2016).A novel approach to safety stock management in a coordinated supply chain with controllable lead time using present value.Applied Stochastic Models in Business and Industry 32(1), 99-112. Cachon, G. P., Zipkin, P.H. (1999).Competitive and Cooperative Inventory Policies in a Two-Stage Supply Chain. Management science, 45(7), 936-953. Chaharsooghi, S. K., Heydari, J. (2010b).Supply chain coordination for the joint determination of order quantity and reorder point using credit option. European Journal of Operational Research, 204(1), 86–95. Chiu, C-H, Choi, T-M,& Li, X. (2011). Supply chain coordination with risk sensitive retailer under target sales rebate. Automatica, 47(8), 1617–1625. Cobb, B. R. (2016). Lead time uncertainty and supply chain coordination in lost sales inventory models. International Journal of Inventory Research, 3(1), 5-30. Duan, Y., Luo, J. & Huo, J.(2010). Buyer–vendor inventory coordination with quantity discount incentive for fixed life time product. International Journal of Production Economics, 128(1), 351–357. Dutta, P., Das, D. & Schultma, F.(2016). Design and planning of a closed-loop supply chain with three way recovery and buy-back offer. Journal of Cleaner Production, 135 , 604e619. Feng, X., Moon, I.,& Ryu, K.(2014). Revenue-sharing contracts in an N-stage supply chain with reliability considerations. International Journal of Production Economics,147, 20–29. FerhanÇebi, I.(2016). A two stage fuzzy approach for supplier evaluation and order allocation problem with quantity discounts and lead time. Information Sciences, 339, 143–157. Govindan, k., Diabat, A.,& Popiuc, M. N. (2012). Contract analysis: A performance measures and profit evaluation within two-echelon supply chains. Computers & Industrial Engineering, 63(1), 58-74. Glock, Ch. H. (2012). The joint economic lot size problem: A reviewInternational Journal of Production Economics, 135(2), 671–686. Heydari, J. (2013). Coordinating replenishment decisions in a two-stage supply chain by considering truckload limitation based on delay in payments. International Journal of Systems Science, 46(10), 1897-1908. Heydari, J. (2014a). Coordinating supplier׳ s reorder point: A coordination mechanism for supply chains with long supplier lead time. Computers & Operations Research, 48, 89-101. Heydari, J. (2014b).Lead time variation control using reliable shipment equipment: An incentive scheme for supply chain coordination. Transportation Research Part E, 63,44–58. Heydari, J. (2014c).Supply chain coordination using time-based temporary price discounts. Computers & Industrial Engineering, 75, 96–101. Heydari, J., Norouzinasab, Y. (2016). Coordination of pricing, ordering, and lead time decisions in a manufacturing supply chain. 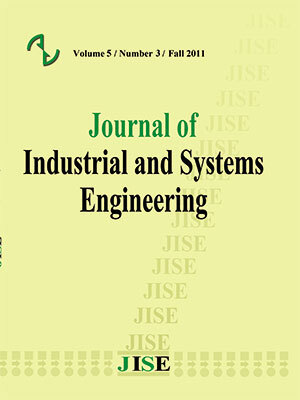 .Journal of Industrial and Systems Engineering, 9, 1-16. Hou, J., Zeng, A. Z., Zhao, L.(2010). Coordination with a backup supplier through buy-back contract under supply disruption. Transportation Research Part E, 46, 881–895. Hsueh, C-F.(2014). Improving corporate social responsibility in a supply chain through a new revenue sharing contract.International Journal of Production Economics, 151, 214-222. Hsu, S-L., & Lee Ch. Ch. (2009).Replenishment and lead time decisions in manufacturer–retailer chains. .Transportation Research Part E, 45, 398–408. Jeuland, A. P., Shugan, S. M. (1983). Managing Channel Profits. Marketing science, 2(3), 239-272. Joglekar, P. (1988). Comments on “A quantity discount pricing model to increase vendor profits”. Management science, 34(11), 1391-1398. Kanchana, K., Anulark, T.(2006). An approximate periodic model for fixed-life perishable products in a two-echelon inventory distribution system. International Journal of Production Economics, 100, 101–115. Kouki, Ch., Jouini, O. (2015). On the effect of life time variability on the performance of inventory systems.International Journal of Production Economics, 167, 23–34. Kreng, V. B., Tan, Sh-J. (2011). Optimal replenishment decision in an EPQ model with defective items under supply chain trade credit policy. Expert Systems with Applications, 38, 9888–9899. Li, J., Liu, L. (2006). Supply chain coordination with quantity discount policy. International Journal of Production Economics, 101(1), 89-98. Li, L., Wang, Y., & Dai, W.(2016). Coordinating supplier retailer and carrier with price discount policy. Applied Mathematical Modelling, 40,646–657. Lin, Y-J. (2010).A stochastic periodic review integrated inventory model involving defective items, backorder price discount,and variable lead time. 4OR, 8(3), 281–297. Liu, Zh.,et al.(2014). Risk hedging in a supplyc hain: Option vs. price discount. International Journal of Production Economics, 151, 112–120. Masihabadi, S., Eshghi, K. (2011). Coordinating a Seller-Buyer Supply Chain with a Proper Allocation of Chain’s Surplus Profit Using a General Side-Payment Contract. Journal of Industrial and Systems Engineering, 5, 63-79. Mokhlesian, M., ZEGORDI, S. H.(2015).Coordination of pricing and cooperative advertising for perishable products in a two-echelon supply chain: A bi-level programming approach. Journal of Industrial and Systems Engineering, 8(4). Muniappana, P., Uthayakumarb, R.,& Ganesha, S. (2015). A production inventory model for vendor–buyer coordination with quantity discount, backordering and rework for fixed life time products. Journal of Industrial and Production Engineering, 1-8. Rosenblatt, M. J., Lee, H. L.(1985). Improving profitability with quantity discounts under fixed demand. IIE Transactions, 17, 388–395. Silver, E.A, Pyke, D.F.,& Peterson, R. (1998). Inventory Management and Production Planning and Scheduling (Vol. 3). New York: Wiley. Song, D-P, Dong, j.-X., & Xu, J.(2014). Integrated inventory management and supplier base reduction in a supply chain with multiple uncertainties. European Journal of Operational Research, 232, 522–536. Soni, H. N., Joshi, M.(2015). A periodic review inventory model with controllable lead time and back order rate in fuzzy-stochastic environment.Fuzzy Information and Engineering 7 (1),101-114. Wong, W. k., Qi, J., & Leung, S.Y.S.(2009). Coordinating supply chains with sales rebate contracts and vendor-managedinventory. International Journal of Production Economics, 120(1), 151–161.